Lay Day is prefect for taking a breather from all the on-water action of Race Week and a great opportunity to have some fun in the sun, try out one of the 60 plus activities Hamilton Island offers or participate in one of our stellar events being held on the day. The beachside pool party is one event not to be missed! Enjoy the beats of live music and the party scene the Summer Bright DJ will be creating along side our main pool area. Chill out in the water, feast on a selection of casual market food and enjoy a Summer Bright or cocktail. Summer Bright will be bringing their Kombie with giveaways all day and awesome fun for all ages to be had. Location: Main Pool. This is a non-ticketed event and is available to everyone. 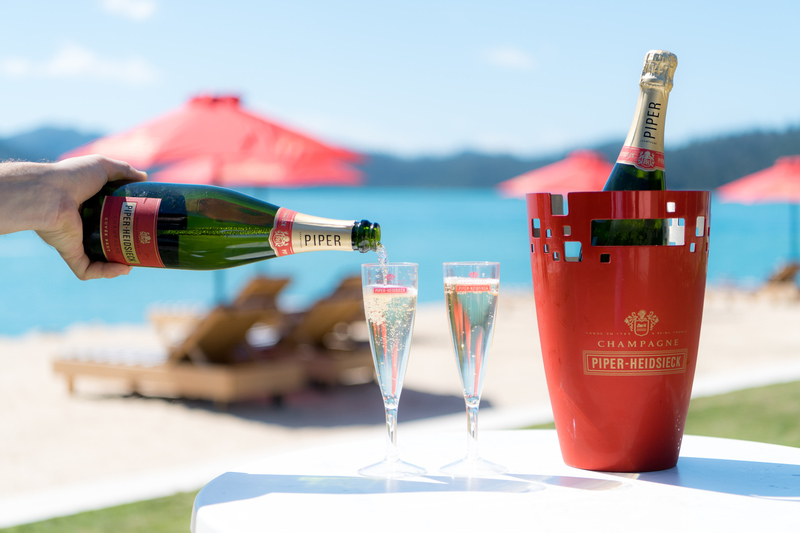 Celebrate Lay Day overlooking the Whitsunday Islands at the Piper-Heidsieck Champagne Lunch held at qualia. A range of acclaimed Piper-Heidsieck Champagnes will be served for your enjoyment and a delectable menu created to perfectly pair with the champagne with be served for a lunch you’ll never forget. You’ll be basking in the sunshine, sipping French Champagne and relaxing with friends… Sounds like a perfect day in paradise to us! Location: qualia. This is a ticketed event. Lay Day is the perfect opportunity to have a crack at the 18-hole championship course with your group and experience the course, which is often described as one of Australia’s most stunning and challenging. Most importantly, don't forget that at the end of your round awaits the fantastic Club House ready for you to relax, unwind and anaylse your game over some drinks and lunch. Location: Hamilton Island Golf Course, Dent Island. Bookings- Click here. On Hamilton Island, you’ll never find yourself short of things to do, with a huge number of daily activities and entertainment options. Popular choices are exploring some of the island’s walking trails, utilising the watersports equipment on Catseye Beach, trying out go-kart racing or taking an ATV tour for an off road adventure. You can also get out on the water with our Jet Ski tour, parasail and if you’ve never seen the region by air book a scenic flight to see the Great Barrier Reef or Whitehaven Beach and the famous Hill Inlet swirls from up above. Location: Tour Desk can assist at the Resort Centre or book ahead of time via our website with links on each activity: See and Do Page- Click here. For the very first time we’ll be hosting the Ketel One Espresso Martini Bar for post lunch and sunset drinks at Bommie Deck. Round out your day time activities with a delicious cocktail, a fantastic view to Dent Island as the sun disappears for the day and it's the perfect place for a pre-dinner drink with friends. Location: Bommie Deck at the Hamilton Island Yacht Club. Open 4pm-7pm.